Nuremberg is a beautiful medieval city where there’s plenty to see. You’re sure to be enchanted by the picturesque Old Town, bewildered by the historical significance of the city, and encouraged by the resilience of the people. Gypsies might come up to you and ask if you have change for specific coins. Don’t take out a handful of coins or the scammer would exchange their coins with yours so fast that you can’t keep track of what was being changed before they run off. Museum and train tickets being sold away from an official window. Before boarding a train or walking into a museum, you have to show your ticket is valid. For tourists visiting, they may not recognize the validation “stamp”; scammers exploit this by selling already validated tickets. Avoid buying voided tickets (usually sold cheaper than the original along with a story as to why they can’t be used) puts you at risk of paying a fine or paying for a real ticket again to enter a museum. Tourism sometimes isn’t pretty, and Nuremberg is a city that has been working hard at confronting the past and educating others to prevent them from making the same mistakes they once did. 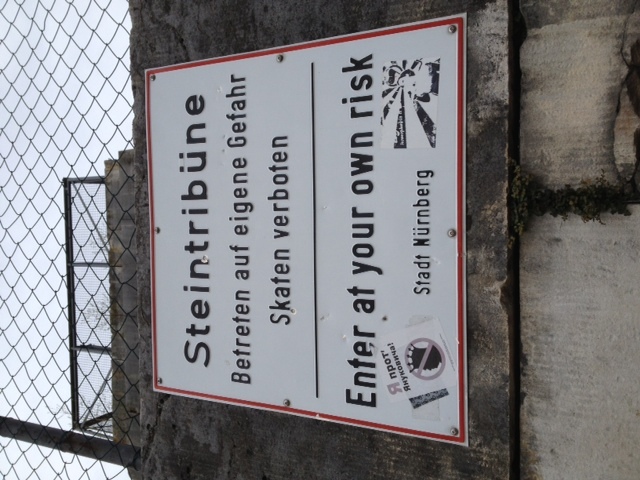 Nuremberg became the venue for the Nazi Party Rallies and subsequently the Nuremberg Trials. It was Hilter’s favorite city, and saw it as an example for all of Germany; one rich in Germanic history and culture. The city paid a heavy price for their Nazi affair, thousands of lives were lost and the city practically destroyed by Allied forces. Yet, from the city’s ashes, Nuremberg has been painstakingly rebuilt, restoring it’s original medieval charm. Nuremberg is a hidden gem and one of Germany’s most underrated cities. There’s so much to enjoy -the beautiful architecture, great museums, craft beer, and very friendly people. Clean, comfortable room with great views and only a 10 minute walk to Old Town. We loved that it was quiet and right next to a shopping center, perfect for late night snacks or laundry detergent. A huge outdoor art installation consisting of 30 pillars, each with it’s own engraving of an article from Universal Declaration of Human Rights. The installation is part of Nuremberg’s effort to reinvent itself as a “City of Peace and Human Rights” and move away from its former Nazi reputation. Nuremberg was honored in 2000, for its exemplary work in promoting peace and respect for human rights and the cities transformation earned it the UNESCO Prize for Human Rights Education. The main reason for visiting was to see the world’s oldest surviving globe. Since the globe was made in 1492, there is no “North America”. It was also very cool to see another Golden Hat. This was a 2nd we saw of 4 in existence in Europe, the first one we saw in Berlin at the Neues Museum. The museum is located south of the historic city center along the medieval city wall. The museum can be a bit confusing to walk through with dead ends and corners you think circle back. Make sure you use your map or ask for assistance getting around. One of the prettiest houses in Nuremberg. Albrecht Durer was a Renaissance artist who was born and died in Nuremberg. He was most famous for his woodcuts, oil paintings and self portraits. We learned a lot about Durer and it was fun to piece together his life with the other places we have visited, especially Venice where he lived and worked much of his life. I also remember seeing many of his work in the Paris Louvre and in the Uffizi, Florence.The museum of his five story house dates back to 1420 and is dedicated to Durer’s life and work. We didn’t go inside the museum, but it was a fun spot to stop by and see. The house is next to the medieval walls just south-west of the Nuremberg castle. Nuremberg is one of the few remaining medieval cities that still have a preserved city fortification wall. The wall dates back to the 12th century and it took over 400 years to complete The walls are some four kilometers in length. The castle itself is three separate entities divided from one another by gates built around a thousand years ago. It is an imperial castle and was once among the most important fortified imperial palaces in the Holy Roman Empire. The walk up to the castle is steep and long, done on purpose to expose would be intruders to prolonged exposure to protective projectiles. You enter the castle through the giant Gate decorated with the Hasenburg family crest, located beside the Hasenburg Tower. Inside you can take a tour or for free you can see the Sinwell Tower, “Sinwell” in Middle High German meaning “extremely round,” constructed separately to be an observation tower dating from the 13th century. The entrance was originally built half-way up the tower, it was to be used as a treasury or a prison. The Sinwell tower is extremely lucky in that is was one of the few buildings to survive the bombing of Nuremberg. The Deep Well, a small half-timbered house in the center of the courtyard houses a 50 meter deep well. It was built in the 13th century with the original Imperial Castle, as a castle without a protected water supply would be extremely dangerous. Nuremberg’s oldest church, St. Sebald dates back to 1215. The church is located near the Nuremberg Castle and contains the relics of Saint Sebaldus’ bones. Being the patron Saint of the city, St. Sebaldus wasn’t even known to be born in Nuremberg. Stories of miracles around St. Sebaldus were many: Angels providing bread to weary disciples, praying for “proof” from God that ended with a nonbeliever being swallowed up by the earth up to his neck, and on a snowy winter night seeking shelter, St. Sebalus used icicles plucked from the roof to keep warm. The shrine of St. Sebald is gorgeous and of the finest German craftsmanship I’ve ever seen. We studied the shrine for a long time admiring the work and the man laid to rest. The “Miracle of the Icicles” is depicted on the base of the shrine. A beautiful corner of Nuremberg of half timbered houses painted in different colors. One of the darkest chapters of Nuremberg’s history is its strong ties to the Nazi Party, enshrined almost still today in the Nazi Rally grounds. The grounds are still there for people to see, however the only thing that remains is concrete. Getting to the museum and rally grounds will require a 15-minute bus ride from the city center. Once you arrive, you will see that the grounds are in a state of decay. Nuremberg has made gigantic efforts to move past it’s hard lesson and has left it’s once beacon of German pride to a place of abandonment and disrepair. Walking inside you can imagine feeling small and insignificant while listening to impassioned speeches by the man standing at the podium. Now, the grounds themselves feel absurd. Moving on we visited the Documentation Centre which focuses on the history of the Nazi party rallies where mass gatherings were used to demonstrate to Germany that Nuremberg was the model of the ‘perfect Aryan community’. The documentation center exhibits the rise of the Nazi power and cultism and plays black and white reels filmed in the rally grounds just outside; tying the significance and the horror the two together for visitors to piece together. Head to the main market square where the Christmas Market, Old Town Festival, and daily Farmers market are held and where locals come to buy their fresh produce. The ornate ‘Beautiful Fountain’ is a well known and hard to miss. There are forty figures decorating the fountain representing important figures of the Christian faith. The pyramid is in Gothic architecture with the figures on each pyramid level representing a different art. At the base is philosophy and arts; second level are evangelists and priests, the third level are the seven electors and nine heroes. Moses and other prophets adorn the crowning level. Walk around the fountain and search the ornate lattice ironwork to find a gold ring. A legend says that if you turn the “golden ring” left three times and make a wish you will be blessed with wealth and good luck. The black ring on the fountain, is said to bless women with a multitude of children. The main market square is towered over by the Church of Our Lady, seen in the background of the photo. Every day at noon the “Männleinlaufen,” mechanical clock dances and chimes. The Fleisch Bridge is a single arch bridge dating back to 1596, that links the St Sebald and St Lorenz areas of the city. You can’t miss it. If you love history as much as I do, then a visit to the Palace of Justice is a must in Nuremberg. The Nuremberg trials were a series of military tribunals, held by the Allies. The trials are notable for the prosecution of the political, military, and economic leadership of the Nazi Party, who planned and carried out extensive war crimes. The trials were held in Nuremberg, Germany, and the resulting decisions marked a turning point in international laws. Visiting the Memorium Nuremberg Trials in the Nuremberg Palace of Justice requires a bit of luck and pre-planning. Upon arrival and purchasing your tickets for a tour, you will be given an audiotour to walk through the building, and if you time it just right and a trial isn’t in session, you can see the courtroom itself. Progressed to the third floor to then explore the museum. If you’ve been reading my blog you would know I LOVE museums and the Nuremberg Trial Exhibit was exceptionally moving. Not that the museum was made up of multi-media storytelling tricks, in fact it was mostly just storyboard installations that took you through Nuremberg’s history before, during, and after WWII. You can see the seats the prisoners sat on, crates used to ship evidence to the trial, and many many stories. However the end of the museum really wants it’s visitors to know that the Nuremberg trial was just the beginning. War crimes have been occurring all across the globe and humanity didn’t have a process to bring justice to those persecuted. Nuremberg is face forward and leave it’s dark past behind, learning hard lessons and determined to never let it happen again. Nuremberg is the home to the pretzel. On our way to the Main Market Square we stopped in here to enjoy a delicious pretzel, waffle, and coffee for breakfast. At €1.60 this is a great snack on the go. When in Nuremberg you must try the Goldenes Posthorn, the oldest wine restaurant in Germany! Their famous Bratwurst sausage, with its distinctive recipe dates back to 1313! The Goldenes posthorn is a cozy restaurant right next to St Sebald church. Here we enjoyed good lean pork sausage, crunchy pretzels, and good dark beer. Seeking something Indian or at least spicy near our hotel, we found a Doner Kabob restaurant with a line out the door (you know the food is good when the lines are long). The food was unbelievably wonderful and not greasy. The meat was juicy and vegetables fresh. We had a bit of a time ordering as no one spoke English, but we got it. I don’t think many tourists come in there, which was nice. We ate here twice and was the best Donor sandwich we’ve had in Germany.